In NOFA-land, there are some farms that are financial successes, where the farmers earn a middle class living and can afford to make continual investments to improve their farms. 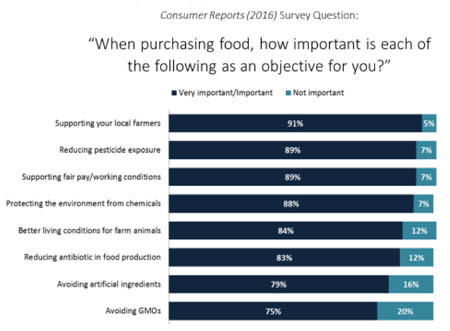 Most organic farmers, however, are not making their full living from their farms. Their earnings from farming are modest and, like most conventional farmers, they have health and other benefits because someone in the family has a “real job” off the farm. When the NOFA Domestic fair trade committee teamed up with Becca Berkey and did a survey of organic farms in 2013, farmers reported that the wages they pay are above minimum wage, though not by much, benefits for workers are limited, and the main constraint to paying more is not farmer willingness, but the level of the prices farmers can get for their products. This is the difficult equation that confronts us: how can we have a just, equitable and sustainable food system supplied by farms using regenerative organic practices with access to healthy food for all if farm prices do not cover living wages for all the people who work on farms? *If selling wholesale, associating with other farmers to form a larger bargaining unit in negotiating with buyers. Farmer marketing cooperatives like Deep Root play this role. *Increasing on farm worker efficiency so that employees can work shorter hours for higher pay per hour. See the profile of Willow Wisp Farm for a good example. *Cutting out crops or enterprises that do not generate enough revenues to cover costs. Old Friends Farm eliminated egg production when they realized that, even though customers liked it, they could not make any money selling eggs. *Diversifying crops and value-added enterprises to provide year-round work for employees and reduce the need for extra help during short peak harvests. Willow Wisp has redesigned its marketing plan to provide steadier work for employees. *Improving the ergonomics of farm work so that it is safer and healthier for workers. Old Friends Farm uses stale bedding techniques to reduce weeds and invests in cultivating equipment that mechanizes weed control. Sweetland Farm has also minimized hoeing and weeding to save time and workers’ bodies. *Marketing the positive experience of working on a farm that has best practices. The Sweetland website declares: “We work hard to keep the share affordable and are committed to investing in soil fertility and paying our employees a living wage.” MimoMex Farm in Goshen, NY raised their share price with the promise to pass some of the additional income as raises for their workers. *Adopting open book management: you allow everyone who works on the farm to see the farm budget and to understand the financial implications of their work and agree to share any increased revenues between the farm and the employees. *Taking workshops in “Relational systems on the farm” such as with Polly Shyka where she provides tools and teaches about ways to articulate, cultivate and strengthen interpersonal relationships for farm resilience and new awareness of farm teams. *Certifying with the Agricultural Justice Project (AJP). The standards for the Food Justice Certified (FJC label) are based on the complementary principles of fair pricing for the farmer and just working conditions for farm and food business workers resulting in a win/win/win/win scenario in which workers, farmers, buyers, and ultimately the public and communities all benefit. You can find a Tool-kit that will help a farm create labor policies and worker trainings that qualify for FJC on the AJP website: www.agriculturaljusticeproject.org. NOFA participates as a founding member of the Domestic Fair Trade Association (DFTA) formed in 2008 to promote fair pricing for farm products and fair conditions of trade, including fair and legal contracts between farmers and their employees and between buyers and the farms that supply them. Along with other domestic fair trade projects like the Fair World Project, DFTA evaluates claims of fairness in the marketplace and contributes to raising issues of fairness before the general public. Passing a resolution like this, of course, is only a first small step to making it happen, but it does show where people’s hearts are and provides the basis for NOFA efforts in pushing for fair trade. State laws that would limit the percentage of the final consumer dollar that a processor or retailer receives to ensure that the producer receives a fair share of the point of purchase price. If farmer pay price goes down, the final price to consumers should also go down. Tax or other incentives, such as special marketing programs, for farms that adopt domestic fair trade standards that include $15 an hour wages for farm workers. Programs like the “Certified NY” labeling program could provide an enhanced label for fair trade farms. NYS has a new Farm Workforce Retention Credit, a fixed dollar amount credit on state tax payments for each eligible farm employee with annual increases through 2021. An implied promise of good faith – the processor or retailer must present the contract to the producer with accurate and honest information. Plain language and discloser of risks – the contract must be easy to read to understand, with a clear disclosure of the major material risks to the producer up front. 3-day review right – the producer has up to 3 days after signing the contract to change his or her mind and cancel the agreement without penalty. Confidentiality clauses prohibited whether oral or written. First priority producer lien – the producer can register a lien, making the producer a primary and secured creditor. This provision significantly increases the producer’s ability to be paid, even if the processor or retailer has financial problems. Recapture of capital investment – if there is not a breach of contract and the contractor terminates, the producer can collect damages related to any significant capital investment that was required as part of the contract. Ban unfair trade practices and clarify producers’ rights such as the right to join producer associations without fear of retaliation from the buyer. This provision would also prohibit “tournament competition” (the ranking system) for payment. Ban on arbitration clauses – implement dispute resolution alternatives such as mediation. Arbitration clauses can limit a farmer’s access to the courts even when a violation of state or federal law has occurred. Conduct an energetic public campaign to spread wider public understanding of why farms are going out of business and promote public support for paying farmers prices that cover the full costs of production including living wages for farmer and farm workers. Create a program to assist family-scale farmers who pay $15 an hour wages to employees in paying for health insurance for themselves and their employees. Establish supportive pathways for migrant people of color (POC) farmers to become land-owning farmers running their own businesses. Funding for training programs led by POC, that address trauma and history, strategies for navigating in a racist food system (e.g. full scholarships for POC to land-grant institutions for agricultural degrees). Hire POC farmers as adjunct faculty to offer on-farm credit-bearing courses for new farmers. Free legal and accounting clinics for farmers and food justice nonprofits to help with contracts, leases, nonprofit status, tax filing, employment law compliance and related business needs. Change the EBT/SNAP system to allow online payment and automatic deduction for farm food purchases. EBT is a federal program but state governments could advocate for this fairly simple change. (a) It established the Commodity Credit Corporation (CCC), which made loans to farmers whenever prices offered by the food processors or grain corporations fell below the cost of production. This allowed farmers to hold their crops off the market, eventually forcing prices back up. Once prices returned to fair levels, farmers sold their crops and repaid the CCC with interest. By allowing farmers to control their marketing, the CCC loan program made it possible for them to receive a fair price from the marketplace without relying on subsidies. (b) It regulated farm production in order to balance supply with demand, thereby preventing surpluses. Since government storage of surpluses was expensive, this feature was crucial to reducing government costs. (c) It created a national grain reserve to prevent consumer prices from skyrocketing in times of drought or other natural disasters. When prices rose above a predetermined level, grain was released from government reserves onto the market, driving prices back down to normal levels. From 1933 to 1953 this parity legislation remained in effect and was extremely successful. Farmers received fair prices for their crops, production was controlled to prevent costly surpluses, and consumer prices remained low and stable. At the same time, the number of new farmers increased, soil and water conservation practices expanded dramatically, and overall farm debt declined. What is even more important is that this parity program was not a burden to the taxpayers. The CCC, by charging interest on its storable commodity loans, made nearly $13 million between 1933 and 1952. There are a few national organizations that endorse parity – the National Farmers Union, the National Family Farm Coalition, and the HEAL (Health, Environment, Agriculture, Labor) Food Alliance. With a little extra policy funding, the NOFAs could support these organizations. Pass the Producer Protection Act for contract reform. See the description above. End the exemption for farmworkers from the National Labor Relations Act (NLRA). Like farmers, farm workers need freedom of association and the legally protected right to organize. Same for the exemption for farmworkers in the Fair Labor Standards Act (FLSA). Farmworkers should be entitled to a decent minimum wage and time and a half for overtime like the people who work in other sectors. If passed on the national level, these changes would not cause competition among the farms of the various states. Push for immigration reform. To protect the 60% of current farmworkers who are undocumented, we need immigration reform based on human rights that includes a path to legal residency and citizenship for farm workers who choose to remain in the US without punitive measures like high fees and a 14-year rigmarole to get to legal status. Even the more liberal bills, like the one proposed by Senator Schumer, include mandatory e-verify that will make farmers’ lives as small employers miserable. In addition to fair prices, there are other potential sources of revenue that can keep market prices down while compensating farmers. Our farms protect the commons of clean water and air, and restore soil carbon. The public can pay us for these services as is done in Europe. Incentives for good practices could be built into the tax system – farmers who build healthy soil could pay lower taxes. NOFA is a member of the National Sustainable Agriculture Coalition which works for a whole series of conservation measures that pay farmers to increase cover crops, improve rotations and pasture management and research that increases our knowledge of organic and sustainable farming systems.